One Bite Of These Perfect, Pillowy Puffs And You’ll Be Hooked! When we have leftover mashed potatoes, we try to think of new and interesting ways to use them, and we have to say, we’re pretty proud of ourselves with this one! 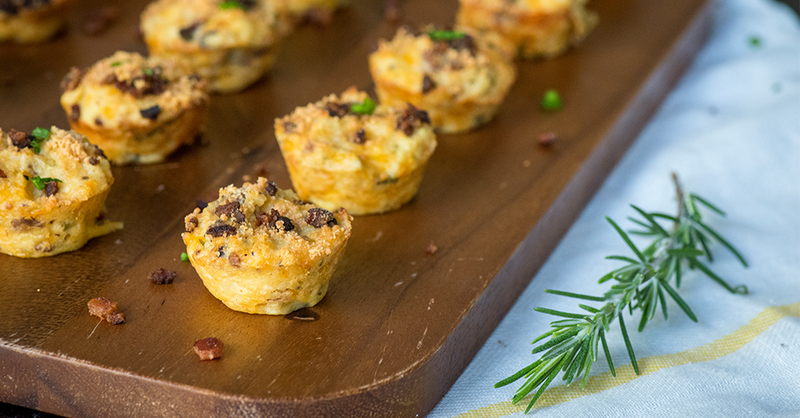 Loaded with cheese and bacon, these mashed potato puffs are like a baked potato in muffin form. And along with amazing flavor, they also have amazing texture – they’re light and fluffy on the inside, and perfectly crisp on the outside, making them irresistible! We love making them for breakfast or brunch, but honestly any time of day is the right time to enjoy these pillowy little bites! Preheat oven to 350º F and liberally grease 1-2 mini muffin pans. In a large bowl, stir mashed potatoes and eggs together until combined. Fold in cheddar cheese, chives, and bacon, and season with onion powder and garlic powder. Using an ice cream scoop or spoon, fill mini muffin tins with potato mixture and sprinkle parmesan cheese over the top. Place muffin tin(s) in oven and bake for 20 minutes, or until tops are golden brown and springy to the touch, and cheese is melted and bubbly.